Over 1300 marketers from businesses of all sizes were surveyed for the 2017 Marketo North America Marketing Benchmark Report which looks at technology, multi-channel strategy, lifecycle marketing and metrics reporting. I’ve pulled out the most interesting and important findings for you … since I’ve already read all 53 pages. You’re welcome. Marketers across the board face the same top 3 challenges: content, people, and alignment with headquarters. To overcome them, marketers rely heavily on the portfolio of tools they have in their tech stacks. Over 60% have six or more tools and 68% feel that their technologies integrate well. An overwhelming 96% state that it’s important for new vendors to integrate smoothly with existing tech. Of the marketers surveyed, 68% publish content at least weekly. Surprisingly, 22% are only posting to social media once monthly! 80% run nurture campaigns that build relationships with potential buyers regardless of their position in the customer journey. If you struggle with finding quality content to share, you’re not alone: 44% of marketers say they struggle to find or create relevant content and 28% struggle with resources. It can be helpful to map out and score content to determine level of interest, align engagement activities and drive more relevant engagement. Use both qualitative and quantitative feedback to measure effectiveness and make adjustments to optimize for market trends. This also helps to ensure that you’re offering relevant and high quality content that ties back to your goals and metrics. 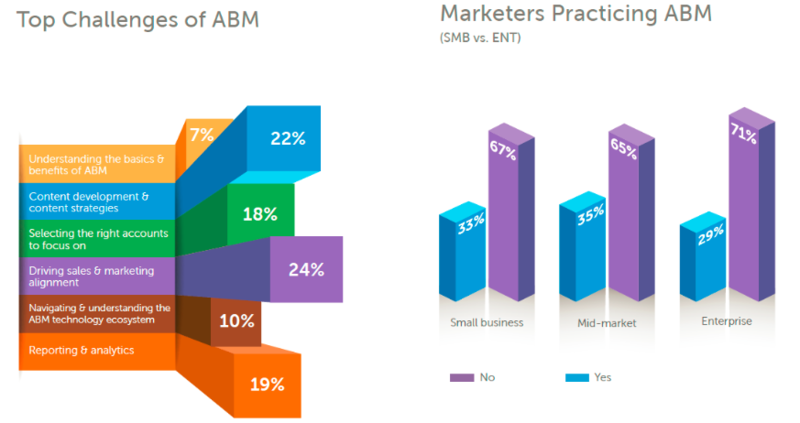 According to the report, 34% of marketers practice account-based marketing (ABM) which allows for a more targeted approach to prospects and customers. 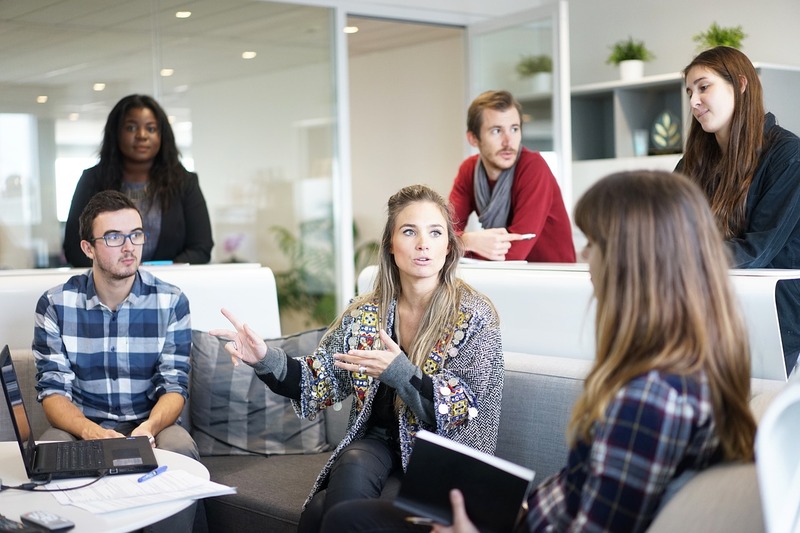 The top challenge of ABM is the alignment of sales and marketing teams (24%), so it is important to develop an ABM strategy that takes these factors into account. Other top challenges marketers face include content development & strategy, reporting & analytics, and selecting the correct accounts to focus on. Web personalization is used to engage your audience by offering them specific, targeted content throughout a website. It is generally driven by marketing, with 44% of roles filled by online or digital marketing managers. Websites can easily be overlooked, but are valuable resources and should be utilized in the most effective way possible. Customizing messaging and offering relevant content will add value to both new and existing customers. The survey results show that marketers invest most in website, email, field sales, events and paid search. New name acquisition is the #1 digital advertising goal which is followed by brand awareness, nurturing, retention & loyalty, and upsell/cross-sell. Pay-per-click (PPC) is ranked as the most effective digital ad channel, followed by display and social (which is gaining ground). Surprisingly, the minority of marketers A/B test a large percentage of their emails: 57% A/B test 0-25% of their emails and only 19% test 50% or more. Two-thirds spend 0-25% of their marketing budget on social media ads. 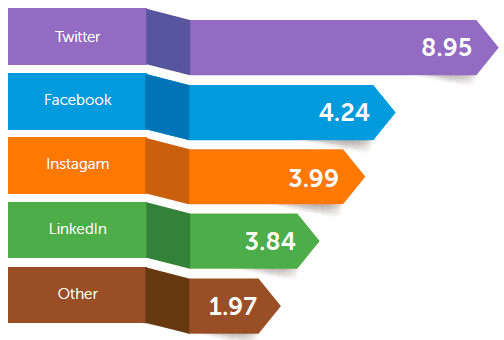 The most valuable social media sites are ranked as LinkedIn, followed by Twitter and then by Facebook. Mobile marketing is becoming increasingly important, but surprisingly only 42% of respondents have mobile-optimized websites and only 26% use mobile ads! You may be surprised to hear that 39% of marketers spend less than 25% of their budget on programs that engage existing customers. Consider that for B2B, 90% of customer value comes after the initial sale! For those who do engage existing customers, the primary focus is on driving usage and adoption, followed by cross-sell/upsell and retention/loyalty. While 74% of customers identify word-of-mouth as a key influencer in their purchase decision, 67% of marketers don’t have customer referral programs and 84% don’t offer a loyalty program. There is a valuable opportunity here! 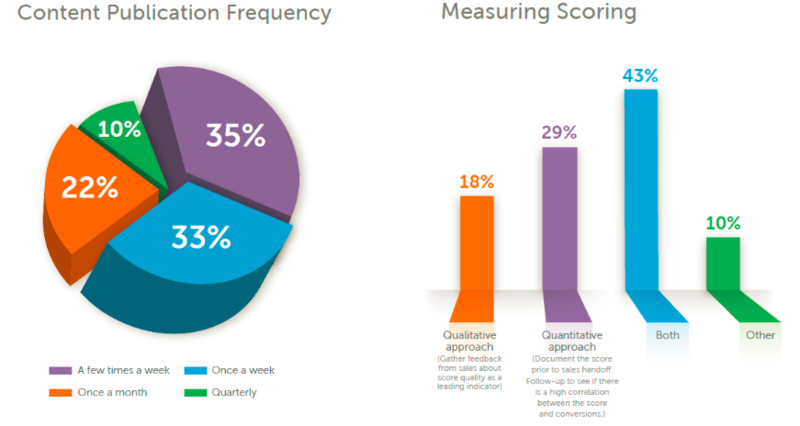 Marketers focus on certain metrics to show value and tie content back to goals and ROI. According to the study, 27% measure clicks, 52% measure conversions, 55% measure opportunities created and 41% measure revenue. These are great, but make sure to track and analyze early-, mid- and late-stage metrics to prove the value of your content. This can show patterns and gaps that can be used to improve marketing messaging, content and strategy. It is projected that B2B marketers will continue to adopt account-based marketing as cheaper technologies become available. To overcome common global marketing challenges, companies need to abandon silos and adopt a ‘center of excellence model’ that allows for cross-functional collaboration and a consistent brand identity. Ensure that any new tools are integrated with the current tech stack and that new investments support short- and long-term goals. Consider whether new tech will be able to grow with the company and if it will help streamline marketing or communication processes. If you want to get the full report for yourself, you can find it here: 2017 Marketo North America Marketing Benchmark Report. Olivia Dippon is the marketing coordinator for ThinkResults where she is responsible for the social media, website and speaker program. 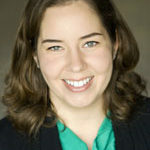 She also assists with client projects, such as the new positioning for an entertainment tech company. Check out our free online quiz about the 10 Elements of a Successful Launch, to see where you fit and what you need to do next. Or simply set up a call with our CEO, Jenn, to talk about your particular situation and how to make your launch successful.